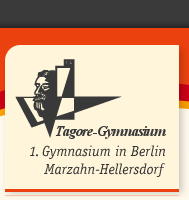 Portrait of the Tagore school - our concept !!! The school is a linguistically and artistically orientated grammar school. Our atmosphere is characterized by an open respectful cooperation as well as by tolerance and non-violence. Students and teachers identify with school and are orientated toward humanistic values. According to the experiences and individual abilities of the students the teachers advance the development of their skills. The ability of independent learning and teamwork is advanced by the inclusion of various conventional and immanent teaching methods. The teachers are in an effort to enhance the quality of the lessons continuous. We promote a multifaceted school life, develop and keep traditions and cultivate contacts outside school. Basis of all academic procedures are a sensible time management as well as democratic opinion and decision making processes.